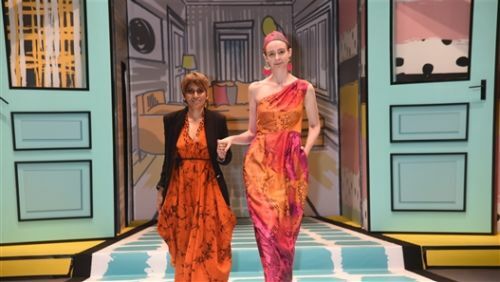 HONG KONG, July 9, 2018 - (ACN Newswire) - The 25th Hong Kong Fashion Week for Spring/Summer opened today at the Hong Kong Convention and Exhibition Centre and will run until 12 July. Organised by the Hong Kong Trade Development Council (HKTDC), the show gathers around 1,100 exhibitors from 14 countries and regions, serving as an ideal one-stop sourcing platform for the industry. Exhibits feature the latest fashion designs, international brands, garments, fabrics and accessories. Under the theme "Happy Collage", about 15 fashion events are being held during the fair, including fashion shows, trend forecasting seminars, buyer forums and a networking reception, presenting the latest market intelligence and fashion items. This year's show also features new exhibitors from Singapore, Sri Lanka and the United States; along with 9 pavilions including India's Apparel Export Promotion Council and The Synthetic & Rayon Textiles Export Promotion Council, the Chinese mainland's Haining, Humen and Keqiao, Japan, Sri Lanka and Thailand's Department of Industrial Promotion and Thailand Textile Institute. Responding to growing demand for professional image building and workplace uniforms, the fair this year introduces the new "Corporate Fashion and Uniforms" zone to provide a wide range of choices for the hospitality, food and beverage, retail and security industries. A fashion parade will be held on Wednesday to showcase fashionable workplace uniforms. The popular "World of Fashion Accessories" section presents fashion accessories such as bags, accessories, belts, footwear, socks, leggings, gloves and scarves. The "Fashion Gallery" features about 85 high fashion brands. The "Clothing Accessories, Fabrics & Yarn" zone showcases quality raw materials. In addition, the show has once again set up an hktdc.com Small Orders zone, featuring nearly 100 showcases and garment racks with about 300 products available for orders in minimum quantities of between five and 1,000 pieces. "Fashion Tech" is one of the hot topics of the fashion industry in recent years, pushing the industry to change up the whole product creation process from production to market launch through technology. The "Fashion Tech" zone is a thematic zone not to be missed by the industry. Exhibits at the zone include luminous fabrics made with an innovative trademarked technology from first-time exhibitor Lumisonata; an application from Hong Kong exhibitor Key Links that monitors clothing qualities across various production lines; a 3D human modelling application from another Hong Kong exhibitor TOZI Technology that provides accurate body measurement with just two pictures uploaded by the user; Konica Minolta is also presenting their cutting-edge clothing printer and MiR (Mobile Industrial Robots). As for seminars, buyers interested in fashion tech should join "The Next Wave in Fashion Industry", where experts will discuss wearable tech in thermostatic clothing and how to get the accurate shapes and sizes using smart 3D human modelling technology. Other exhibitors include Japanese footwear brand FIT JOY, which brings a lightweight footwear made with quality goat leather. Besides, Hong Kong exhibitor MsEnvy is launching a new collection of couture womenswear that features delicate patterns digitally printed on silk. Another Hong Kong brand HOTITLE's Speed Racer collection features cufflinks inspired by sports cars' wheels which can be dismantled to enable customisation. To create more business opportunities for exhibitors, the HKTDC has organised 90 buying missions from 45 countries and regions to the show, including buyers from over 3,600 companies. They include representatives of renowned fashion labels, mega chain stores, department stores and fashion e-tailers, which encompass a number of Belt and Road markets, such as the Czech Republic's Fresh Labels, Indonesia's Zilingo, Kazakhstan's Anthena Clothing, Korea's Eland Group, Russia's Shmotka, Singapore's Takashimaya and Thailand's Jaspal. A series of seminars and forums will be held during the show, including a presentation by international trend forecasting group Fashion Snoops on their Autumn/Winter 2019/20 fashion forecasts for Women's & Men's Wear and accessories. A seminar titled "Online Shopping Reshapes the Fashion Industry" will feature seasoned industry experts discussing recent online retailing market's development and opportunities, while a seminar on "Essential Testings and Ratings for Textiles and Garments" will see experts detail testing requirements for textile chemistry, restricted substances for green textiles, as well as introduce a new rating system that can improve the purchasing practices and achieve sustainable supply chains. During the fair, a number of runway shows will be staged, including a fashion parade held today by students from the Chinese University of Hong Kong's School of Continuing and Professional Studies. For product launches, four designers from Sri Lanka presented their latest collections which combine traditional local fabrics with modern designs at today's first "International Fashion: On Parade" session. In addition, Macau Productivity and Technology Transfer Centre will host an international fashion parade tomorrow to showcase the latest collections from budding designers. Under the theme "Happy Collage", about 15 fashion events are being held during the fair, including fashion shows, trend forecasting seminars, buyer forums and a networking reception, presenting the latest market intelligence and fashion items.